Like migratory birds, most of Canada’s 20,000 “guest” farm workers arrive in the spring and leave in the autumn. Hailing primarily from Mexico, Jamaica, and smaller countries of the Caribbean, these temporary workers have become entrenched in the Canadian labour force and are the mainstay of many traditional family farms in Canada. Many of them make the trip year after year after year. 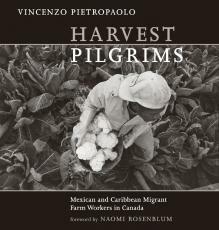 Vincenzo Pietropaolo has been photographing guest workers and recording their stories since 1984 – in the process travelling to forty locations throughout Ontario and to their homes in Mexico, Jamaica, and Montserrat. The resulting photographs have been highly acclaimed internationally through many publications and exhibitions, including a travelling show curated by the Canadian Museum of Contemporary Photography that opened in Mexico City. 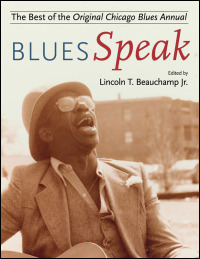 Due out in 2010, this annual periodical, a labor of love edited by Chicago Beau (Lincoln Beauchamp), was very popular among those who sought books on the blues. I’m glad to see that some of the best writing from that journal will be available again. Author: Edited by Lincoln T. Beauchamp Jr. This incomparable anthology collects articles, interviews, fiction, and poetry from the Original Chicago Blues Annual, one of music history’s most significant periodical blues publications. Founded and operated from 1989 to 1995 by African American musician and entrepreneur Lincoln T. Beauchamp Jr., OCBA gave voice to the blues community and often frankly addressed contentious issues within the blues such as race, identity, prejudice, wealth, gender, and inequity. 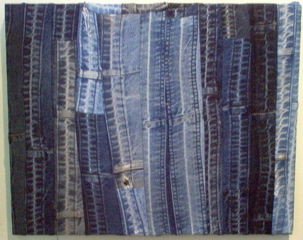 OCBA often expressed an explicitly black perspective, but its contributors were a mix of black and white, American and international. Likewise, although OCBA‘s roots and main focus were in Chicago, Beauchamp’s vision for the publication (and his own activities as a blues performer and promoter) embraced an international dimension, reflecting a broad diversity of blues audiences and activities in locations as farflung as Iceland, Poland, France, Italy, and South Africa. BluesSpeak includes key selections from OCBA‘s seven issues and features candid interviews with Koko Taylor, Eddie Boyd, Famoudou Don Moye, Big Daddy Kinsey, Lester Bowie, Junior Wells, Billy Boy Arnold, Herb Kent, Barry Dolins, and many more. The volume collects work from literary artists such as Eugene B. Redmond, Quincy Troupe, Kalamu Ya Salaam, Julie Parson Nesbitt, and Hart Leroy Bibbs. Also featured are heartfelt memorials to bygone blues artists, insightful observations on the state of the blues in Chicago and beyond, and dozens of photographs of performers, promoters, and other participants in the worldwide blues scene. Lincoln T. Beauchamp Jr. is a Chicago-based musician, writer, publisher, record producer and promoter. Muddy Waters gave him the name “Chicago Beau,” and he has recorded and performed with some of the most respected names in music, including Memphis Slim, Archie Shepp, Pinetop Perkins, Fontella Bass, the Art Ensemble of Chicago, the African choir Amakhono We Sinto, and Frank Zappa. 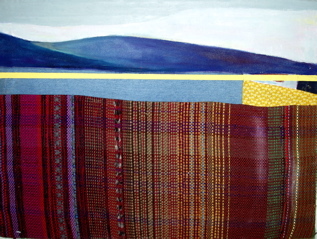 Land is the common thread. 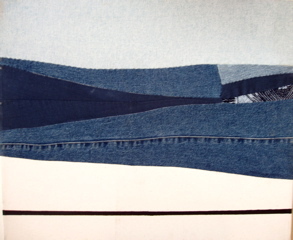 I’ve been working with denim. 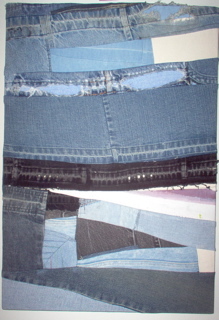 Recycled, worn out, discarded blue jeans. 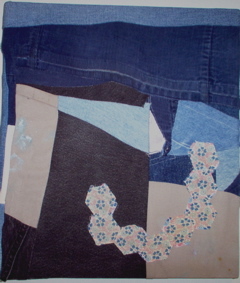 Learned to sew, to embroider. Many years, many miles from the farm. 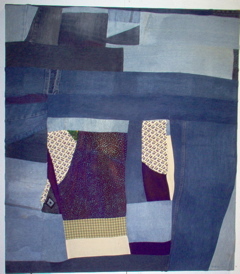 In the body of my work. The history of Chicagou begins with their landscape. Images of slaves and cotton. Defines our history, our people. 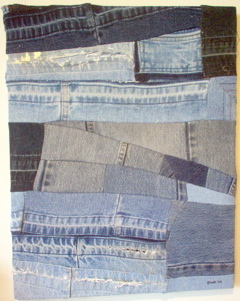 With discarded worn-out blue jeans. 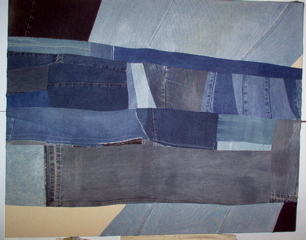 These are the fabrics of work, of the land. As we built, as we plowed. So you see we’ve come full circle. 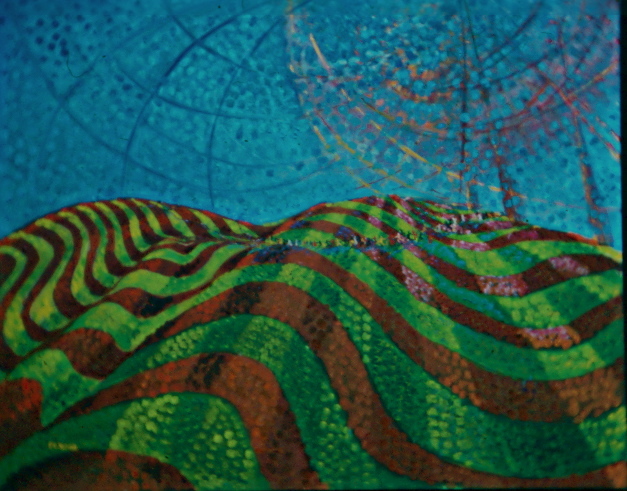 And I’ve been painting circles too. 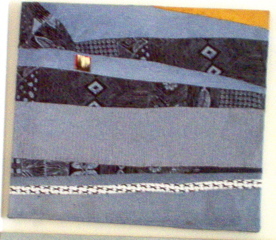 The Stitched in Time and Place and the Landquilt series express the lived experience of class as expressed in fiber art and craft in a global economy of abundant availability of commercially produced consumer goods. 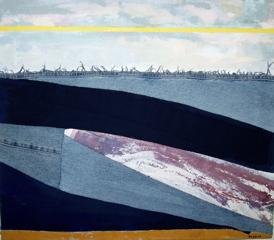 In some ways the denim “paintings” refer to/remind one of traditional landscapes like “We Are All One People” to the right, or “Border Line” at the bottom of this page. 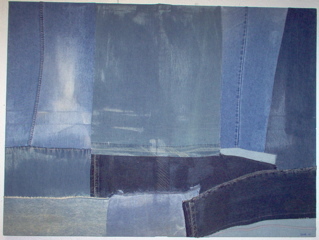 These paintings use denim both as a pigment and as a canvas. 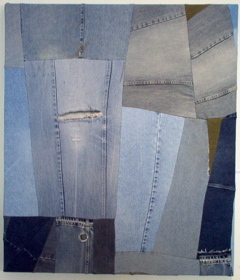 Miner’s Blues and Migrant Labor are constructed from fragments of blue jeans which have been thrown away. Often I have rescued them from dumpsters. Sometime they are give to me by friends who know my work. 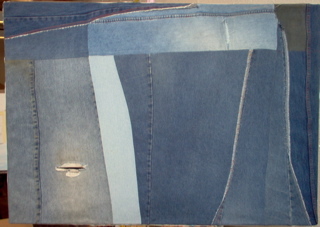 These used jeans have a beautiful patina in the heavily worn and torn sections. 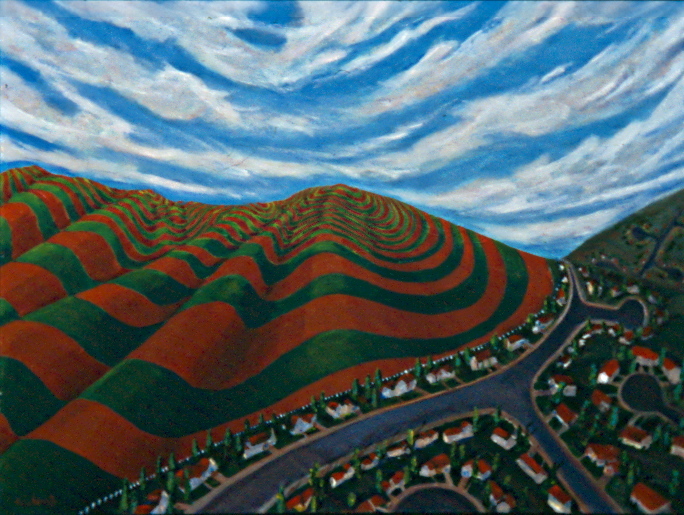 Miners Blues is a landscape. At the top is a blackened sky, dark with clouds and harsh weather or polluted air. Below the horfizon line we see a cross-section of the scarred and excavated seams of minerals below the earth’s surface. It is mined by men whose work is dangerous, unhealthy and difficult, but necessary to them and their families’ survival. 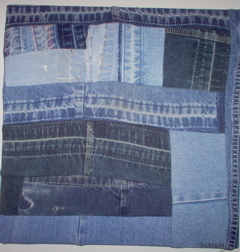 “Blues” has a double meaning, referring both to the jeans they wear and to the hardships endured to earn their daily bread. leaves and re-connects to the ground. 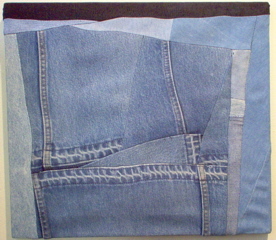 The opened hems of pant legs have faded to beautiful patterns suggestive of aerial views of railroad ties, roadways, and crop furrows. The impact of the migrant’s footsteps leave behind an imprint of use as a tactile x-ray of the workers’ labor and migrations. Location: University of Illinois at Chicago (UIC), U.S.A.
What does it mean to prepare teachers to teach toward social justice? Across the United States and around the world, educators face many challenges. Especially troublesome are the economic, social, and political contexts that make difficult our attempts to address differences and oppressions in schools and society. Yet, in the face of these challenges, teacher educators are continuing to produce significant theories, practices, and coalitions. The largest conference to date, the 6th International Conference on Teacher Education and Social Justice will offer rare opportunities to discuss cutting-edge research, develop innovative resources, build networks, and explore possibilities for new directions in teacher preparation. The Conference will draw together over five-hundred educators from around the world with diverse experiences but with shared commitments and priorities, including scholars from Australia, Canada, Chad, Chile, India, Korea, Kyrgyzstan, Nigeria, Palestine, Uganda, and across the United States. ** Special Note** The Conference Organizers are pleased to announce that registration is free for the 6th International Conference on Teacher Education and Social Justice. All participants must pre-register for the conference by November 20th. Space is limited, and on-site registration will not be available, so please pre-register early. Participants are responsible for their own transportation, lodging, and meals. CAOE does not issue letters of invitation to participants from outside of the United States. Reframing Race, Gender, and Teacher-Education Policy: The Conference will highlight cutting-edge research and theory on race, gender, and teacher-education policy, particularly regarding new and innovative ways to conceptualize policy and politics of teacher preparation at the intersections of race and gender. Workshop on Publishing for Emerging Scholars: Designed for emerging scholars (graduate students and recent graduates) in the field of teacher education and social justice, this three-hour workshop offers invaluable tips and unravels the “unspoken rules” for publishing books and journal articles. Facilitated by the Director of CAOE, this popular workshop is free with conference pre-registration and is scheduled to be held at the end of the conference. Booksale: Bring an extra bag with you to carry home new books and resources that you are sure to want from our impressive booksale and resource tables. Networking Reception: A highlight of previous conferences, the Networking Reception provides an opportunity to meet other conference participants in an informal setting with light refreshments. All educators, researchers, and educational leaders and advocates throughout the United States and the world and from all levels and disciplines are invited to attend and participate in this conference. This conference is free and open to the public; however, all participants must pre-register for the conference by November 20th. To pre-register, please download the Pre-Registration Form either in MSWord or in PDF. Space is limited, and on-site registration will not be available, so please pre-register early. Refreshments will be provided throughout the conference. Participants are responsible for their own transportation, lodging, and meals. CAOE does not issue letters of invitation to participants from outside of the United States. The Conference will be held on the campus of the University of Illinois-Chicago in the EPASW (Education, Performing Arts, and Social Work) building, 1040 W. Harrison Street, Chicago, Illinois 60607. Maps of the campus, as well as parking information, can be downloaded at http://www.uic.edu/index.html/maps.shtml. The University of Illinois at Chicago is conveniently located near downtown Chicago and adjacent to the UIC/Halsted station of Chicago’s rapid transit, the “L”. Conference participants are responsible for their own transportation, lodging, and meals. Thanks from the Curriculum Fair and Next Steps – Get involved! dation funding. This is a grassroots project and the critical mass of volunteers and activists is truly inspiring. It felt like the education movement we are building. There were over 700 attendees, 30 Teacher curriculum exhibitors, 38 resource tables, 9 workshops, art, t-shirts, books, and more. • Keynote speakers, the Association of Raza Educators (ARE) from California emphasized the struggle to remake the world is a collective one, not about individuals. It takes organization, analysis, courage, and humility. • TSJ delegates to Honduras shared the stories of the Honduran people’s struggle for democracy and the leading role of teachers. • CORE gave us the lowdown on building a social justice teachers union. • CYIC inspired and challenged us to stand up with them for education justice. their righteous struggle to reclaim their neighborhood school. • Kevin Coval and Young Chicago Authors closed it out with words and rhymes to move us forward. Get involved and help bring this energy to your school, community, students and youth, and into the struggles we are waging for education justice in the city. STAY INVOLVED! IT TAKES ALL OF US! The Center for Study of Working Class Life is pleased to announce the How Class Works – 2010 Conference, to be held at the State University of New York at Stony Brook, June 3 – 5, 2010. Proposals for papers, presentations, and sessions are welcome until December 14, 2009 according to the guidelines below. Purpose and orientation: The conference seeks to explore ways in which an explicit recognition of class helps to understand the social world in which we live, and ways in which analysis of society can deepen our understanding of class as a social relationship. Presentations should take as their point of reference the lived experience of class; proposed theoretical contributions should be rooted in and illuminate social realities. Presentations are welcome from people outside academic life when they sum up social experience in a way that contributes to the themes of the conference. Formal papers will be welcome but are not required. All presentations should be accessible to an interdisciplinary audience. Conference themes: The conference welcomes proposals for presentations that advance our understanding of any of the following themes. The mosaic of class, race, and gender. To explore how class shapes racial, gender, and ethnic experience and how different racial, gender, and ethnic experiences within various classes shape the meaning of class. Class, power, and social structure. To explore the social content of working, middle, and capitalist classes in terms of various aspects of power; to explore ways in which class and structures of power interact, at the workplace and in the broader society. Class and community. To explore ways in which class operates outside the workplace in the communities where people of various classes live. Class in a global economy. To explore how class identity and class dynamics are influenced by globalization, including experience of cross-border organizing, capitalist class dynamics, international labor standards. Middle class? Working class? What’s the difference and why does it matter? To explore the claim that the U.S. is a middle class society and contrast it with the notion that the working class is the majority; to explore the relationships between the middle class and the working class, and between the middle class and the capitalist class. Class, public policy, and electoral politics. To explore how class affects public policy, with special attention to health care, the criminal justice system, labor law, poverty, tax and other economic policy, housing, and education; to explore the place of electoral politics in the arrangement of class forces on policy matters. Class and culture: To explore ways in which culture transmits and transforms class dynamics. Pedagogy of class. 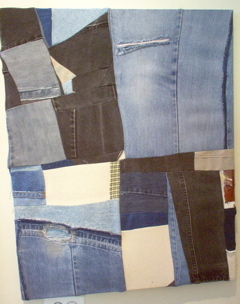 To explore techniques and materials useful for teaching about class, at K-12 levels, in college and university courses, and in labor studies and adult education courses. Proposals for presentations must include the following information: a) title; b) which of the eight conference themes will be addressed; c) a maximum 250 word summary of the main points, methodology, and slice of experience that will be summed up; d) relevant personal information indicating institutional affiliation (if any) and what training or experience the presenter brings to the proposal; e) presenter’s name, address, telephone, fax, and e-mail address. A person may present in at most two conference sessions. To allow time for discussion, sessions will be limited to three twenty-minute or four fifteen-minute principal presentations. Sessions will not include official discussants. Proposals for poster sessions are welcome. Presentations may be assigned to a poster session. Proposals for sessions are welcome. A single session proposal must include proposal information for all presentations expected to be part of it, as detailed above, with some indication of willingness to participate from each proposed session member. Submit proposals as hard copy by mail to the How Class Works – 2010 Conference, Center for Study of Working Class Life, Department of Economics, SUNY, Stony Brook, NY 11794-4384 or as an e-mail attachment to <michael.zweig@stonybrook.edu>. Timetable: Proposals must be received by December 14, 2009. Notifications will be mailed on January 19, 2010. The conference will be at SUNY Stony Brook June 3- 5, 2010. Conference registration and housing reservations will be possible after February 15, 2010. Details and updates will be posted at <http://www.workingclass.sunysb.edu/>http://www.workingclass.sunysb.edu.